2010 May 13 and after: CardWorld, a small example of English-language understanding including syntax, semantics and pragmatics. 2005 Apr 20: A revised subset of the npX grammar and some new semantic classes are described in and accessible from page SemanticValuesClassHierarchy. They demonstrate how meaning representations can be computed for English phrases in a way that is more sophisticated than is possible with only the basic tools provided in the asd and asdx packages. 2003 Aug 12: npX - a large modularized grammar for English noun phrases. This grammar is defined in 18 separate modules and provides a good example for testing ASDEditor, ASDParser, and ASDTester and the utility programs ASDCheck, MergeGrammars, and DefinedUsed. However, it is a work in progress and is far from complete. In particular, semantic action and semantic value computations have not yet been written for it, and there is not yet a Java program, comparable to Nounphrase1.java below, to drive it. Nevertheless, it illustrates several things about constructing large ASD grammars. cardinal.grm - a small example grammar for English cardinal-numeral phrases such as "twelve million twenty three thousand four hundred and seventeen". It can be displayed and edited with the ASDEditor. It can also be edited with any simple editor for text files, though such editing must be done carefully. Otherwise it may create an ill-formed file which cannot subsequently be read by the ASDEditor. The latest version (2002 Feb 2) accepts commas and hyphens in the input, so it will recognize phrases like "two million, three hundred forty-six thousand, five hundred and seventy-nine". The new version requires version 1.04 or higher of ASDParser. 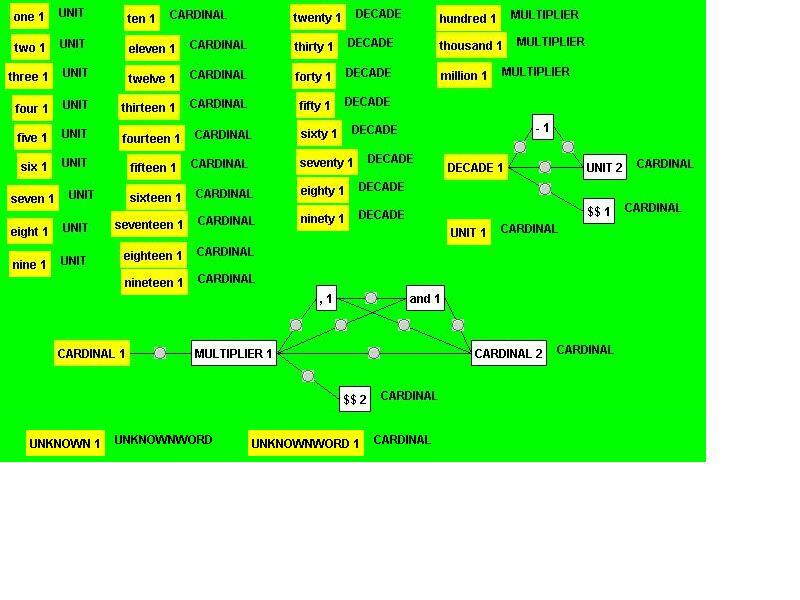 cardinal.jpg - the grammar from cardinal.grm as it is displayed by ASDEditor. nounphrasesimple0.grm - a larger example grammar, a partial grammar of English noun phrases like "my three big, friendly dogs", "the five hundred members of a square-dancing club", "those two of my father's suits in the front hall closet", or "the Queen of England's crown". (Notice the syntactic ambiguity of the possessive in the last example.) This file uses, but does not include, the grammar from the file cardinal.grm. nounphrasesimple.grm - the grammar obtained by using an ASDEditor to merge nounphrasesimple0.grm into cardinal.grm. Nounphrase1.java - The source code for the class Nounphrase1 in the package english. Nounphrase1 uses an ASDParser and illustrates use of the nounphrasesimple.grm grammar to parse English noun phrases. It provides a graphical user interface that permits the user to type in a phrase, to parse the phrase to try to find one or more interpretations of it, and, when parse attempts are successful, to display the phrase structure and the semantic feature values computed for the phrase. Although this example provides only partial coverage of English noun phrase structures, it involves a fairly large example grammar and it illustrates a number of interesting ways in which ASDParsers and ASDEditors can be used. Note: For this program to work correctly, the grammar file nounphrasesimple.grm must be in the subdirectory from which the program is started. See the package notes for more details about how Nounphrase1 works and what it illustrates. EnglishNoun.java and EnglishWord.java - source code for two other classes in the package english. These provide static methods for some useful computations on words in English. See the source code, the package notes and the javadoc documentation for details. english.jar, english.zip, and english.tar.gz - class archive files for the package english, which currently includes the classes EnglishNoun, EnglishWord, and Nounphrase1. Package notes about the english package.